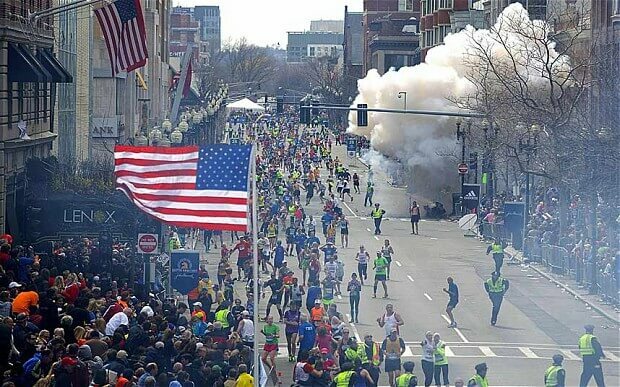 Before seeing any official reports about the tragic bombing in Boston, I knew that something big, and probably quite terrible, had happened. As a rule, unless working on an assignment that requires 24/7 diligence, I give myself the luxury of keeping my ringer off while working. By the time I picked up my phone late Monday, I found 4 missed calls and over 50 related text and e-mail requests for comment/input both civilian and military, already pending. Fear is a powerful catalyst. As a nation, we are horrified by the vicious and callous acts of the bomber (s); we grieve for the victims and their families; and we are afraid. It is too soon to know whether or not the Tsarnaev brothers will ultimately be found to be responsible for the bombing, but it is not too soon for us to begin individually and collectively to come to grips with what has happened. The fact is, we are not, and never will be, completely safe from those who choose to commit seemingly random acts of violence that kill and maim. Those intent on causing harm as a way to gain notoriety or vent rage born of political, ethnic, religious or extremism, mental illness (or some more general form of social pathology) live among us. What we can and must do, is to resist any attempts by the media, members of our government, or armchair analysts, to convince us that attacks like these can be neatly categorized and squarely blamed on a particular group or practice. Humans naturally fear chaos. Violence and instability leave us feeling frightened and overwhelmed, and in our struggle to understand what is happening, we are vulnerable to those who provide simplified answers that allow us to feel as though we are back in control. Once we have a person/group to blame, fear turns to anger. The response is understandable as a coping mechanism for the short term; but, it’s useless in helping us to heal, or to prevent similar heinous events in the future. In my work, I have met with individuals and small groups who identified themselves as warlords, arms dealers, insurgents and terrorists. They are people. (Except perhaps some of the arms dealers.) While it may never become clear to us why, one thing that they all have in common is the idea that they are being forced into what they are doing; they truly believe that they do not have a choice. In their minds, it is external forces and an environment created by others that has put them into their current, inescapable situation. Those of us who have not walked a mile in their shoes see things quite differently. But history has demonstrated that neither ideas nor mental derangement can be defeated by force. Whatever disturbed reasoning was behind the recent tragedy in Boston, we would do well to resolve not to opt into the easy way out of blaming an “ism,” political militancy, ethnicity, etc. By doing so, we make ourselves out to be victims; we feed the flames of bigotry, and support a dangerous “us” vs. “them” mentality. Except for the members of our First Nations tribes, we are a country of refugees. Unlike any other country in the world, once you arrive in the United States and are embraced as a citizen, you are an American. (If that doesn’t seem remarkable to you, just try doing that in France — for example – where even after citizenship and residency of 20 years, you would never be considered “French.”) We have a history of opening our arms to members of the human family from everywhere in the world and we stand proud of the fact that we are a nation of many cultures, faiths, and peoples. But like many countries before us, we have become increasingly suspicious of those who we envision to be the least like our imagined idea of the American “norm.” We have tightened our borders, and become much less welcoming, and at times, outright hostile, towards those who arrive hoping to build a better life, just as most of our ancestors did. If we are to heal, if we are to make our nation safer for our children and our children’s children, we must do a better job of learning about one another within our borders, improving our international relations outside our borders, and electing leadership more representative of our population, including ethnicity, faith & gender. We must teach our children to appreciate our differences, while focusing on the overwhelming similarities and ideals that most human populations share. We must take these words to heart. We know better; I trust that we can & will do better.